The ability of a jet plane to become airborne, defying the laws of gravity, is directly related to its power to produce forward thrust. Thrust is generated when rotating fans push air through the rear of jet engines, producing forward movement. As the speed of the aircraft increases, its propelling power lifts the plane, keeping it aloft, its intended purpose. 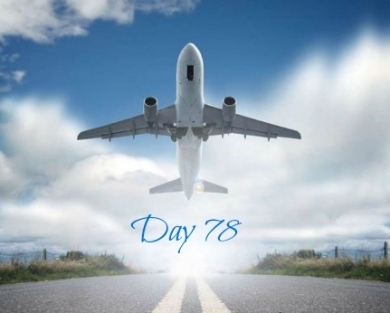 Imagine an aircraft at full throttle, tied to an immovable tree with an unbreakable chain. The jet would be grounded despite the exertion of great power. Christ-followers are often like that jet engine chained to an immovable tree. We contain within ourselves the limitless power of the Holy Spirit but do not experience its effect. What quenches that power? Choosing to gratify the strong emotions and sinful desires of our old nature thwarts the miraculous working of God’s Spirit. As a result, there is no forward momentum in our lives to lift us out of sinful thoughts and behaviors. Like a chained jet at full throttle, we are incapable of lifting ourselves out of sin. Striving in our human strength inhibits a personal understanding of the incredible greatness of God’s power working in, and for, those who believe. Instead of holy transformation, endless cycles of frustration and defeat become our sad reality. What “strong trees” are keeping you chained in patterns of sin and stunted spiritual growth? Perhaps you’re facing bleak circumstances, unmet expectations, or difficult relationships. Christ died to secure victory over sin and peace in every circumstance as you live by faith and trust in His promises. As a jet plane ascends, defying the law of gravity, you too will rise up, freed from the chains of sin and death. In humility and repentance, come to Jesus. Let the explosive power of His Spirit and Word lift you high above evil.